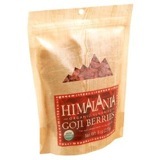 Goji berries are over 5000 years old. Hailing from the pure mountain air of the Himalayan Mountain Range, they have long since been used in Chinese and Tibetan Medicine for myriad of health issues. Organically grown and certified. They are a super food to snack on to boost your immune health! We suggest adding them to trail mix. Gojis contain 20 amino acids, 8 necessary amino acids, 3% polysaccharide and more that 30 macro and micro elements. Contains high level of antioxidants and trace minerals, such as iron, zinc, and selenium work to enhance immunity. We LOVE this company! Also try their Himalayan pink salt. TWJ Select Product!